A disgraced local director has produced a movie 'Money not Enough' in 1998 to portray the financial problems in this now the most expensive city in the world. Besides wages being suppressed by massive influx of foreign workers, corporations are using discreet ways to wring more profits out of people. They are pretty successful in making more profits by making consumption hard to measure. I'm an old-fashioned guy when it comes to washing myself. I still use soap. Many people have switched to shower foam which is costlier. Not only is it costlier, people use more of it since liquid form squeezed onto their palm are hard to measure. The container of shower foam is often opaque as well reducing consciousness. End result: Hard to measure so use more(spend more). Along the same reasoning behind more spending via credit cards (not seeing cash) than cash(more prudent). I'll bring a small sized soap(cut to size if necessary) with me during overseas trips on budget accomodations. Is more practical than packing a small bottle of shower lotion which the bottle might spill inside the luggage. Did you realise there's less & less aluminium can drinks sold in 24 pack-cartons at supermarkets? The plastic 1.5l bottle has become the de-facto way by which drinks are sold. I very seldom order drinks even when eating at hawker centres due to the absurd markups. I might buy natural drinks like sugar cane but not the others. 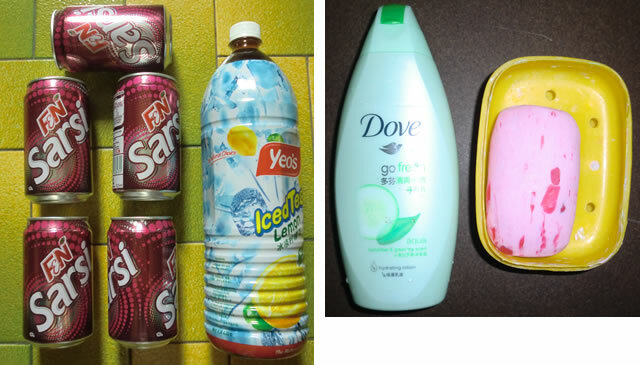 Drinks are often sold in 1.5l bottles at supermarkets instead of aluminium cans for the same reason - people don't measure when pouring unlike a limited can. End result: pour more to drink so spend more. The thoughts of others be it not-close friends, acquaintances, coworkers of me being so hard-up on not spending money on a drink during meals doesn't bother me. In the journey to financial security, hard choices have to be made. It doesn't make much sense for me to pay for a severely mark-up drink with ice when i drink to my heart's content(still find it hard to do so) by buying a large bottle or a few cans more for the same price at the supermarket. If one succumb to peer pressure to look good by spending money on too much unnecessary stuff early on, the financial journey will be even tougher ahead. Where have you been? Is this blog dead?